Library for Parents” at Esgob Morgan, one of our Patron of Reading schools. 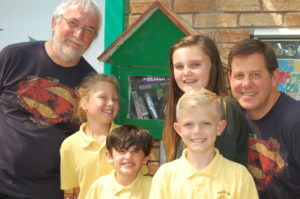 Headteacher, Tim Redgrave, had three “book boxes” made and placed around the various school entrances, so that parents can borrow, swap and recommend books to each other. We think it’s a great scheme and one we hope that other schools will pick up on!